Come on a Fiber Arts Stroll with me! Last Saturday was the Sisters Outdoor Quilt Show Fiber Arts Stroll. It's sort of a preview of what's to come and always lots of fun. In the quilt above those are 1/2 inch squares! Other fiber arts are displayed and demonstrated, though I mostly paid attention to the quilts. There were spinners and felters, weavers and dyers. There was a special exhibit of these Fractured Art quilts. In this one, several quilters worked on one piece, but each taking a section of an image and doing just that part independently of the others. The level of detail is just amazing! It's hard to see here, but these are very 3 dimensional. In the same building there was a display of these Playful Portraits. They were created by local quilters in classes with June Jaeger, Catherine Conkey and Lura Schwartz-Smith. Below are Ann Richardson's corgis. Ann is the fearless leader of the SOQS. Her corgis are famous in town for appearing in all the parades pulling a little tiny cart. I've shown many pictures of them here. Several of the others are done by quilters in my local guild. They've done an amazing job of rendering their favorite canine buddies in cloth! Jean Wells had a special gallery showing of some of her new artwork. She is the featured quilter this year and will be inducted into the Quilter's Hall of Fame. Her work is just gorgeous! I'm amazed by Jean's creative and physical energy with all that she does. There's a new eatery in downtown Sisters called Poppies. They have a marvelous plant nursery surrounding a sweet little house. Inside they were giving away the most delicious samples. They just opened for business on Tuesday, and I can't wait to go see what they've got for lunch next time I'm in town. In the Sisters Art Works building there was the display of framed postcards for the Wish Upon a Card project. I sent in three this year and two were matted for sale, shown below. I didn't find the third, so I don't know if it was sold or maybe was still getting framed? I somehow forgot to get photos of them before I sent them in, so I don't even remember what it looked like! In the Sisters Library was an amazing display of quilts for a challenge called Earth, Wind, Fire and Water. There is so much creativity here. Lots to look at so I'll let the quilts speak for themselves. Enjoy! How does a room full of unschoolers manage to be so calm? What can bring together friends and family in quiet contentment? It's the magic of Zentangles! If you haven't heard of this wonderful art form, you can read about it here and here. There's a wonderful Flickr site filled with Zentangles too. I first heard of it last year, but didn't pursue it. Then, this January I took that machine quilting class with Ann Richardson and she talked about them again. I figured I had better learn more about it. I ordered a kit and was blown away by the beauty and simplicity of this technique. I took it to a Mom's Night Out and hooked all of them. Chloe took the idea and totally ran with it. She has no problem coming up with ideas, so she prefers to make it all up on her own rather than following any directions. For all of these kids, this was the first time they tried it and the results are fabulous! 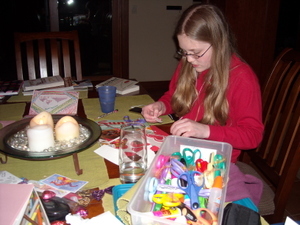 One of the benefits to doing a Zentangle is the meditative practice. Everyone who has tried it has really enjoyed the calming effect. 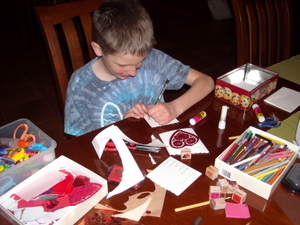 I've heard from several parents that their kids are now enjoying the act of making Zentangles in their free time. The above is Chloe's. She follows her own muse. I am in awe of her creativity! PS- The photos are taken inside Dudley's, the shop mentioned in the knitted tree post. In fact, this big table is where the knitting group meets. It's my Dad's birthday today! Hope you have a great one Dad! My Dad is the one who got us all into hiking and camping. A few years ago he rode his bike across the US, accumulating 4000 miles on the odometer. Mom and Dad have just started a trip to Alaska in their RV. It should be quite an adventure for them. My dad did have a chance to squeeze in some wins at the county fair before leaving. He had 4 first prizes and it shows he must be a pretty good cook. This is the Santa he carved for me in 2007. He made whole wheat bread. And two kinds of jam. Chloe and I didn't quite live up to his four blue ribbons, but we had our own successes as well. My shawl (draped on the mannikin inside out- I wonder if knitters were arranging things) placed third. You can also see a peak of my friend, Sarah's, vest to the right. She got second place in the same category which included shells, stoles and vests. I couldn't believe they didn't have a category just for shawls. My liberated batik quilt got first in the machine quilting category. That did surprise me because there was a pretty big field in the category. Chloe got a second for this mixed media wintry scene. She also got a second for this digital art. And a second for her knitted blanket for Scrabble. Congratulations to Dad and Chloe for a job well done! All in all it was a very satisfactory Fair year. We are already making plans for next year! Today is Chloe's 16th birthday! As a cheese lover she decided that a savory sixteen party would be more in keeping with her personality than a sweet sixteen. She made plans long ago for a swim party followed by a cheese tasting, pizza and cakes decorated like pizza. Then, at Christmas her plans were delayed by her medical issues which meant she was on IV nutrition for 6 weeks. Now she's back to eating but with recovering from surgery she won't be swimming or eating big meals for a while. So we are taking it easy, but having some of her favorite foods as well. We started off with waffles for breakfast (served on a plate Chloe made a little while ago) and will have homemade pizza for dinner. Ryan wants to make a chocolate cake so we'll be doing that this afternoon. We'll still be doing that savory party, but in a couple of months. I have three gifts in the works for Chloe, but didn't finish a single one. Good thing she's not upset about that. The quilt she's holding up above is one that I made for no one in particular, but I was working in my sewing room last week and talking about quilts with her and said she could pick one to be hers. She chose this one. It's all basted and ready to hand quilt. I've also got a scarf and some socks going. The scarf is a modified version of Forbes Forest by Kathy Zimmerman from Scarf Style. The yarn is Crystal Palace Merino 5. I just took out the middle motif because the scarf was wide enough without it. The socks are Batholemew's Tantalizing Socks (view is of the front and back) from Cat Bordhi's New Pathways for Sock Knitters. The yarn is a mediumweight Socks that Rock mill end. I think the socks may be done first. Meanwhile she got a few other things including a gift certificate to Blurb. Can't wait to see what she does with that! Happy Birthday my sweet and savory girl! 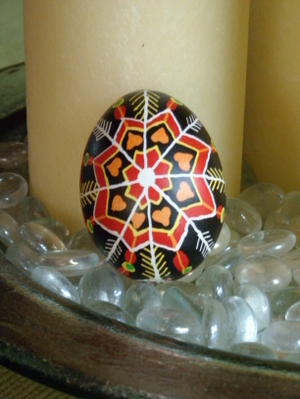 A thoroughly enjoyable afternoon was spent making Pysanky today. 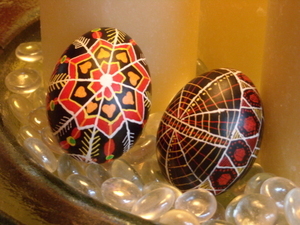 These are Ukranian Easter Eggs and they are certainly challenging! 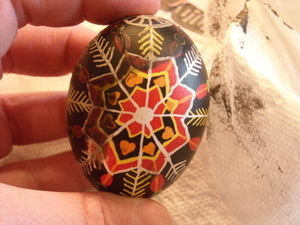 Our kit came from the Ukranian Gift Shop and included lots of great dyes, three kistky and a block of beeswax. The really nice thing is the dyes last up to a year, so we are saving these and will be doing it again sometime. We actually only made up 5 dyes and there are about 7 more in the kit. 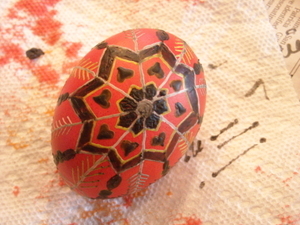 I started off by lightly drawing a design on my egg (blown out and the holes covered over with beeswax). 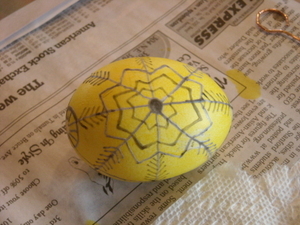 Chloe did hers on a fresh egg which it says is possible. I'll believe it when I see it! 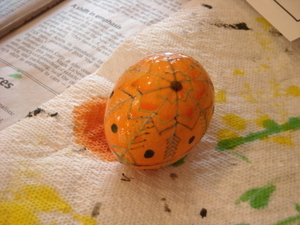 It might look like I have a cracked egg, but those are the lines I drew. 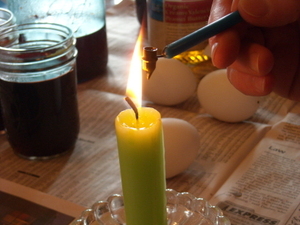 I heated the kistka in the candle flame to melt the beeswax and started drawing over my lines with the wax. 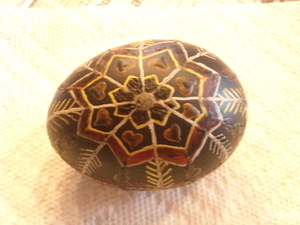 One thing we discovered is how difficult it is to make the designs come out even on the egg. Luckily, I don't worry about that too much and just got down to business. 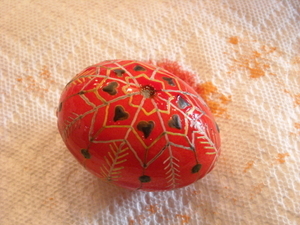 With Pysanky the dyes are built up one on top of the next, so you go from light to dark. Yellow is the first color. 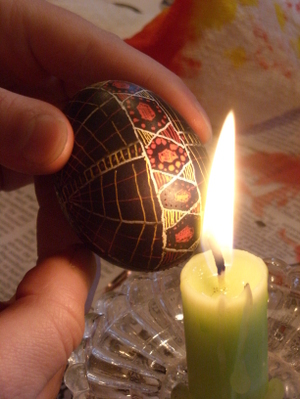 The wax lines are left on the egg until the very end. 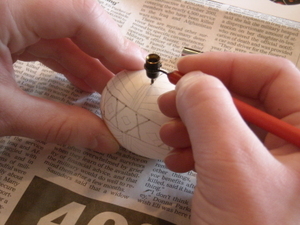 Between each color more lines or shapes of wax are added. 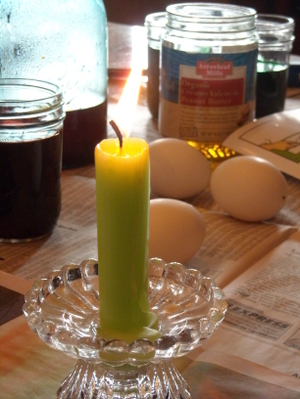 The final step is amazing when you heat the egg next to the candle flame to melt the wax and wipe it off. The design is slowly revealed (wavy lines and all). 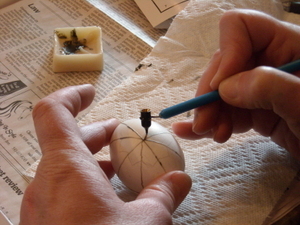 I made two more quick and dirty eggs with a couple of blown eggs that had large holes. These went very fast whereas the first one took about 1.5 hours. Chloe did one more as well. 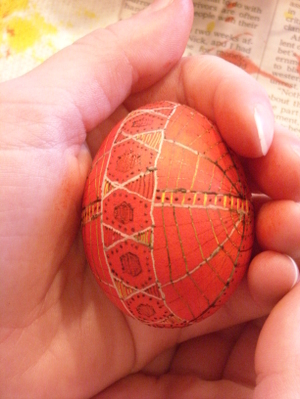 This was such a fun activity that I can see doing one or two every year! We've already had a very full day and Mark and I haven't even gone out for our Valentine's dinner yet! Today the kids and I went up to Mt. Bachelor for a snowshoe tour and snow tubing. What a blast! The weather was absolutely gorgeous and we had a great time. 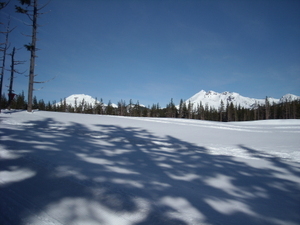 In this photo, to the left is South Sister and to the right is Broken Top. We had some fun last night making our Valentines. I was so glad to have a few hours to work on them as it's become a tradition. Earlier in the week I thought we might not have time. By the way, on Tuesday I went with my mom to see a showing of the documentary, The Breast Cancer Diaries. It was really great and I'm glad we went. I highly recommend it if it is ever showing in your neck of the woods. Anyway, we made Valentines and Ryan did so great! 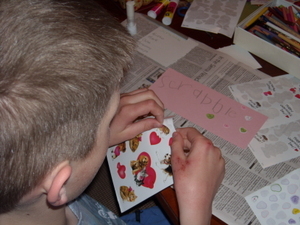 He is showing more of an inclination for arts and crafts lately. I wrote out the names of those he wanted to make them for and he copied the names. Actually his hand writing has improved tremendously. I think he made about three Valentines for his favorite puppy! Chloe made a beautiful pop-up Valentine for her grandparents. 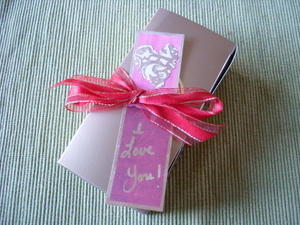 I made bookmarks for everyone. I had a little trip to the Stitchin' Post last weekend for a free workshop on using Shiva Paintstiks. I've had the supplies at home for a while, but just hadn't gotten around to using them. Now that I've tried it out I can't wait to do it again. 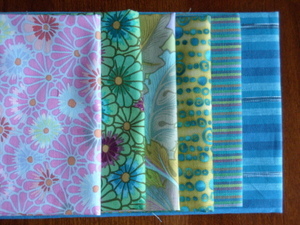 Anyway, while there I couldn't help but pick out some gorgeous fat quarters and I while I was at it, why not get 13, since when you buy a dozen the 13th is free! 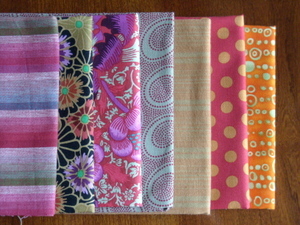 Some of these are from the new Kaffe Fassett line and they are gorgeous! The lucky thing is that tomorrow and Saturday I'm taking a class with Jean Wells, the owner of the Stitchin' Post, and I get to take another look at the fabrics while I'm there. 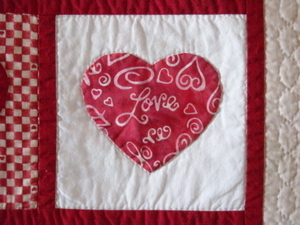 The class is called "Intuitive Quilting" and I'm really looking forward to it. It's been such a hectic week, but I did have a couple of hours the other morning to work on Better Not Pout. Tonya sent out a motivation post over at the Lazy Gal Winter Class blog and I felt like I ought to get going on it. I decided to use the Christmas tree picture that Ryan did on the left. 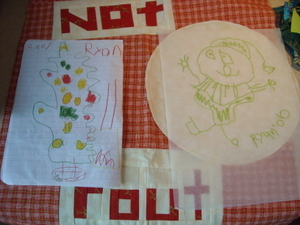 The Santa on the right will be appliqued and embroidered onto the circle of white fabric. I think I'll probably use buttons for the baubles on the tree. In the center, if you look closely, is a green truck (I think) and I might see if I can find a truck button for it. I also have some other ideas about how to do the truck, but that can wait until the quilting is done. I still have to do the sleeve and beading on Chloe's birthday quilt. I hope to have Sunday as a totally free crafting day! Oh, that would be so nice! 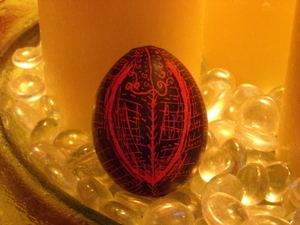 Lastly, here are some dragon eggs made by Chloe's Campfire group. Aren't they cool! 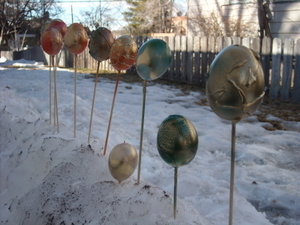 They blew out the eggs and hot glued them onto the skewers. 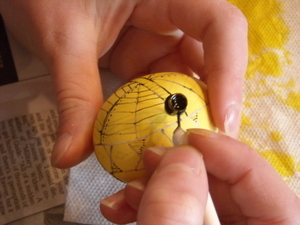 Then some of them applied the hot glue in swirls on the eggs and lastly they were spray painted. I think they are gorgeous. 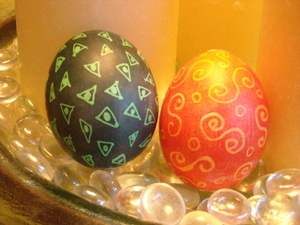 This would be so much fun to do for Easter eggs.